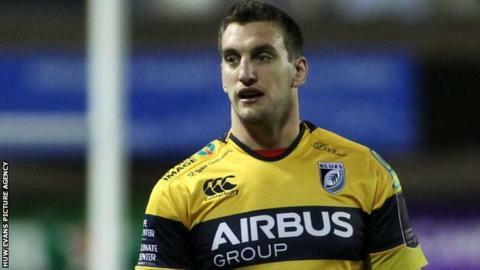 Wales captain Sam Warburton says he will play for Cardiff Blues against Edinburgh next weekend, a week before the start of the Six Nations, as he continues his comeback from injury. The flanker, 27, played 80 minutes on his Blues return in Friday's European Challenge Cup 74-6 win over Calvisano. "First game back, you're not going to play the best. I need games under my belt, to get the lungs going," he said. "That's the plan - I get released and play against Edinburgh next week." Warburton had not played since injuring his ankle in November. Wales face Ireland in their Six Nations opener in Dublin on 7 February. "I was desperate to get back before the Six Nations and play for the Blues," Warburton continued. "I always need games, just to get that sharpness around the breakdown, get rid of some cobwebs - I had couple of rusty carries [against Calvisano]. "It was a lot of attacking rugby, so it was a good blow. Less collisions than normal, but great to get back playing. "Next week I imagine there'll be a lot more defensive work as well."